Continuous Forms | SG Printing Inc.
A Continuous Form works well when you need an efficient way to produce many copies of a single document for business forms such as order forms, packing lists, invoices or receipts. They can be produced to work with a dot matrix printer so you can add information digitally or by hand. 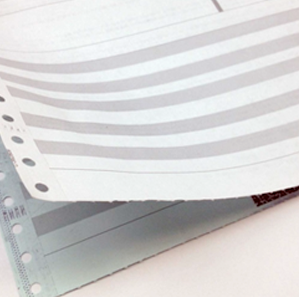 SG Printing can produce them in two to five part forms, in multicolour sheets to facilitate filing and order tracking. Continous Forms are an efficient way to provide multicolored copies of a single document with a conventional dot matrix printer. Use them as order forms, packing lists, invoices, receipts, and more. Signatures, and other information can be added to the form by hand. They're available in 2 part up to 5 part forms.